I have installed iTerm2 and was hoping I'd have something like guake (Yes I just switched from Ubuntu). I mapped the hotkey to a button of my choice and it works fine, but I miss the slide-down-from-top animation like I had in Ubuntu. You can use iTerm2's system-wide hotkey with the Hotkey Window profile to do this. 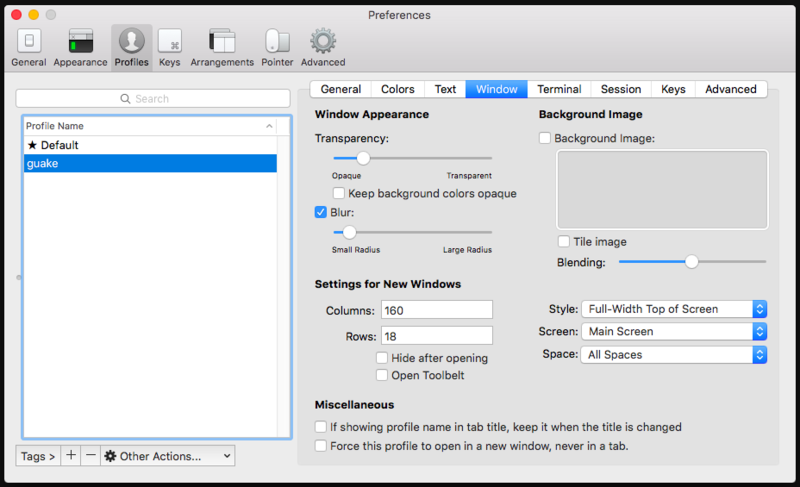 In iTerm2 preferences, click on the "Keys" tab. In the bottom left, under "Hotkey", check "Show/hide iTerm2 with a system-wide hotkey" and assign the hotkey you'd like to use. Check the "Hotkey toggles a dedicated window with profile:" option and choose "Hotkey Window" in the popup menu below (should be selected by default). With default settings, the Hotkey Profile window will stretch across the top of the screen, and the hotkey will drop the window down from the top, complete with animation. If you're not married to iTerm2, you could try TotalTerminal. The slide down window is always a keystroke away. EDIT - I've loved Total Terminal for a long time. However, in late 2015 I moved to iTerm2. It does all the things I loved TT for, but without any of the issues I ran into. Turn on multiple desktops, have 2, one on top one on bottom. Assign a hotkey to switch to the TOP desktop. Open iTerm2 and put it in the top desktop and open all other apps on the bottom desktop. Either make the terminal maximized or full screen (lion) and it should give you something similar to what your're looking for. While iTerm2 suggestion is a good one, it has a few problems of its own. The hotkey activates all iTerm2 windows. Before OS X 10.11 El Capitan I used TotalTerminal (Visor) and I loved it. I had Visor sliding from top down and I used iTerm2 too, depending on task etc. iTerm2 itself seemed not enough for me when I moved to El Capitan. But there's a way to closely replicate my old setup. 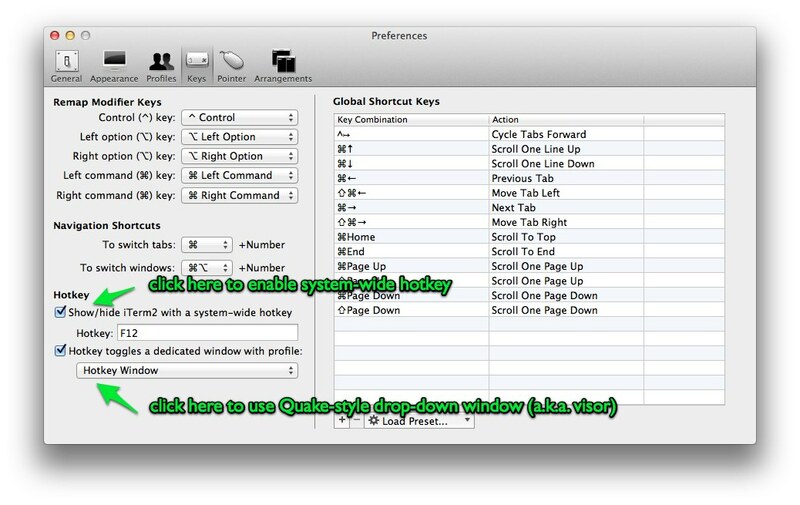 A tine app called Apptivate can assign global keyboard shortcut to any application, script, etc. And they can be switched on and off (hidden) with the same shortcuts. Thus you can easily use Apple's Terminal in a way you used Visor (except for the animation). So I'm back with my old combo (Terminal.app + iTerm2) and it's close to ideal. Maybe it will help you too. Just an update on @joelseph answer, with the new interface. The best solution I have found has been dTerm(http://decimus.net/dterm). Not the answer you're looking for? Browse other questions tagged terminal iterm . 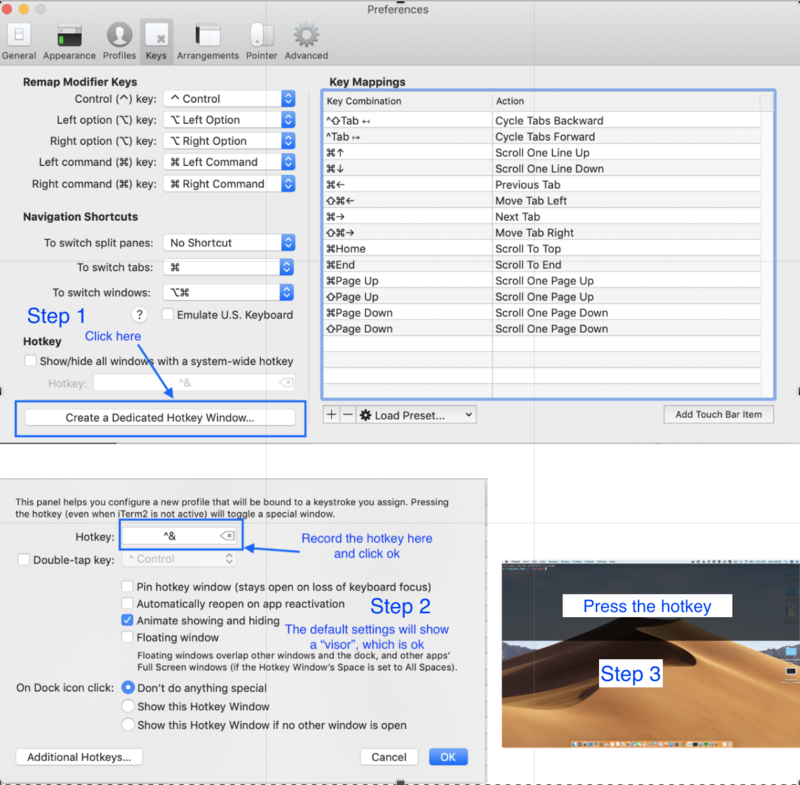 How do I configure a global hotkey for iTerm 2? How to prevent iTerm2's Hotkey Window from changing desktop?